YMCA White House is proud to announce the Middlesex Yeomanry (Duke of Cambridge’s Hussars) Concert Band will be performing a special Christmas concert on Saturday 10 December, 2.30pm. Tickets cost just £10 per person, which includes a programme and refreshments. Tickets can be purchased by emailing judy.morrison1@btinternet.com or calling 020 8941 1227. It’s set to be an exciting concert for all the family with a packed programme of music, from favourites like The Snowman and a Christmas medley, to stunning extracts from Miss Saigon and L’Arlesienne – and of course thrilling pieces from Tchaikovsky and the unforgettable Regimental March. Notable attendees who regularly attend the concerts are the Mayor of Richmond, Lisa Blakemore, MP Dr Vince Cable and local councillors. “The Duke and Duchess (of Cambridge) would have me send their very best wishes to all at the Middlesex Yeomanry (Duke of Cambridge’s Hussars) Concert Band,” says Lieutenant Commander James Benbow, Royal Navy Equerry to H.R.H. the Duke of Cambridge. The Middlesex Regiment was first raised in Uxbridge in 1797 and a band was formed as a mounted band in 1843 when it received the title of the “Duke of Cambridge’s Hussars.” The band was stood down in both world wars. After World War 2 it was reformed at Uxbridge as the band of the Middlesex Yeomanry. With the reorganisation of the Territorial Army in 1967 the band was transferred into 31st Signal Regiment, but was still based at Uxbridge with the Middlesex Yeomanry Squadron. Another reorganisation in 1968 saw them being disbanded. However, in 1969 with special permission from the Ministry of Defence Col.S.J.”Bill” Williams kept it in existence as a civilian band but keeping the uniforms and instruments. On Col.Bill’s death in 1999 the band had to move location. After one or two false starts Ron Keevil was able to arrange for the few remaining players to be rehoused with their library at YMCA White House of which it is now an integral part. The Band reformed as the Concert Band of the Middlesex Yeomanry Regimental Association. The band is now at full strength and rehearses at YMCA White House on Sunday mornings. 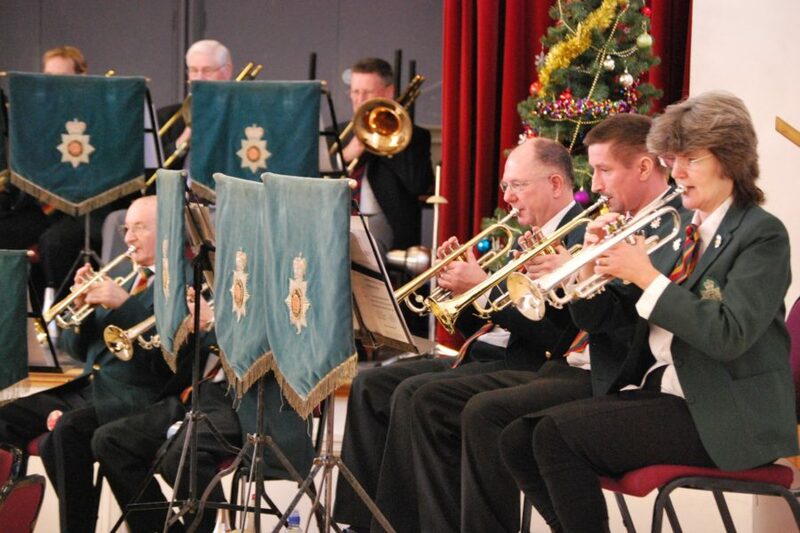 A number of members have served as musicians with the RAF or famous military regiments, the rest are made up of musicians from the community but all share the joy of music making.